Tech features are a favorite subject among us here at Arrow Ford Inc. Safety, handling and tech features are what distinguish one ride from the next. Ford Fusion's tech features are one reason why it remains a popular choice in the mid-size sedan category. Here are two new Fusion tech features worth a closer look. 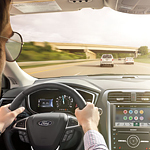 Ford Fusion comes with a five-year complementary trial of SirusXM Travel with Travel Link. SiriusXM offers 150 channels of commercial-free news, sports, entertainment and exclusive content. Meanwhile, Travel Link is your source of 3D maps linked with GPS, delivering turn-by-turn voice-navigation, weather, traffic info and route details, such as gas station locations and prices. Ford Fusion interfaces with your iPhone or Android via Siri or Google, respectively. The Ford SYNC 3 infotainment system accommodates both platforms, letting you tap into your phone's capabilities hands-free. Send/receive calls, send messages, consult Google Maps, or play Apple Music or Google Music. See for yourself with a test drive today at our Ford dealership.